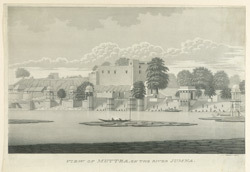 'View of Muttra [Mathura] on the River Jumna'. Engraved and published by James Moffat. Undated. bl.uk > Online Gallery Home	> Online exhibitions	> Asia, Pacific and Africa Collections	> 'View of Muttra [Mathura] on the River Jumna'. Engraved and published by James Moffat. Undated. Aquatint with etching of a view of Mathura on the river Jumna by James Moffat dated 1800-1815. Mathura, on the banks of the river Yamuna between Delhi and Agra, is a sacred city for Hindus. Established as far back as 600 BC, it was famous as an important city of the Kushana empire in the 1st century AD, and when the Chinese traveller Hiuen Tsang visited it in the 7th century it was well-known for its Buddhist monasteries. It was an artistic centre for several centuries, producing images for all the great religions of India, Hinduism, Buddhism and Jainism. Its influence on Indian art declined when it was subjected to upheavals, most notably the sacking of the city by Mahmud of Ghazni in 1018. Mathura's fortunes revived when it became a centre for the Vaishnava cult by the 15th century and it is celebrated now above all as the site which Hindu mythology designates as the birthplace of Krishna, the popular incarnation of Vishnu.